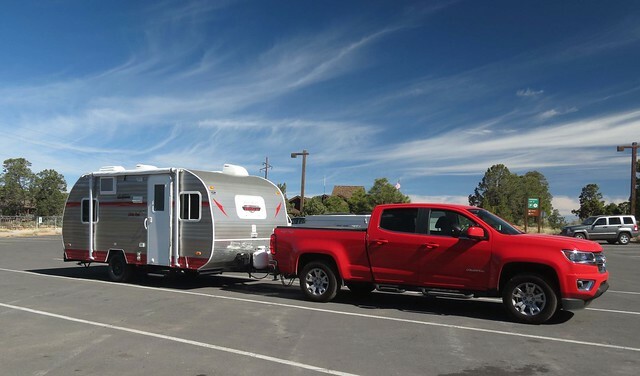 We took our first trip with our new tow vehicle, a 2015 Chevy Colorado. About 450 miles each way, ABQ to Grand Canyon and back. While there are some picky design things (every vehicle I’ve ever owned had a few things I’d change), it works great. Our 4Runner, which we kept, has a 5,000# tow limit, but even at 3000# or so, the frontal area of the Retro made us wish for more margin at times. I’m also happy that the motion transfer from the trailer to the passenger seat is greatly reduced, so my queasiness from it is gone. My biggest beef is that a scent was applied, apparently at detailing, that is fading s…l…o…w…l…y. Best word picture is that it is like wearing a mask made up of strong dryer sheets. It set off a major asthma attack for a friend a couple of days after we bought it, and it isn’t great for my asthma, still makes my eyes itch after a couple of hours, plus gives me a headache. I need to find a place to destink it, steam clean it or something. Call the dealer and request that a complimentary cleaning to de-stink it, making them aware of health issues that arise from the scent that was judiciously applied without your approval. I’m getting to that point. I had hoped it would fade well enough, quickly enough that I didn’t have to do that. I don’t want yet another odor laid over the top of this one, so need to know that anything that is used is not scented – plain steam cleaning, for example. Nice Truck!! I like the red. The red color is just coincidence, but many of my vehicles seem to have been red. The Retro turned out to be the travel trailer that met our needs, and my bonus was that it was cute. Since the dealer had three on order, we chose from those colors; the pewter and red looked nice. When we went shopping for a new tow vehicle, a truck was not actually what we thought we’d find. Turned out to find this one, and it was red 🙂 The TT and truck are both 2015 models, so the colors go well together. I have contacted the dealer about the scent, we’ll see what happens. I had already included a complaint about it in the satisfaction survey we filled out last weekend.